Leading off today: Riley Burke and Noah Craig scored the winners' goals as Fayetteville-Manlius edged Baldwinsville 2-1 in boys soccer between ranked Class AA teams Tuesday. D.J. Taylor scored for the Bees. Baldwinsville began the week ranked fifth and Fayetteville-Manlius 12th in the NYSSWA ratings. The teams will have an Oct. 7 rematch at Baldwinsville. More boys soccer: Scarsdale knocked off No. 7 Mamaroneck 2-1 in more Class AA action. Takumi Osaki scored off a Nico Bernard assist with two minutes left in the second overtime. Girls soccer: Anna Hewlett scored the goal as Webster Schroeder edged Fairport 1-0 in a clash of Section 5 unbeatens in Class AA. Schroeder was coming off a tie over the weekend vs. Spencerport, ranked No 1 in the state in Class A. • Burnt Hills-Ballston Lake turned a corner kick by Annabelle Morrison into a goal as Aerin Dicruttalo converted with 1:34 remaining in a wild 5-4 victory over Bethlehem. The win was just the second in nine games for the Spartans and handed the Eagles their first loss in the Suburban Council. Molly Boone gave Burnt Hills a 4-3 lead with her second goal of the game with 10:21 left, but Grace Hotaling scored her second of the day for Bethlehem with 7:21 to play. Milestone: Coach Jon Beardsley won his 300th game when Fillmore downed Genesee Valley 3-0 in girls soccer. Fillmore improved to 6-0, all by shutouts. Carmen Mancuso scored twice. Girls swimming: East Aurora sophomore Mary Brinker broke a pool record that had stood since 1992, winning the 100-yard freestyle in :54.70 as the Blue Devils downed Eden 122-65. 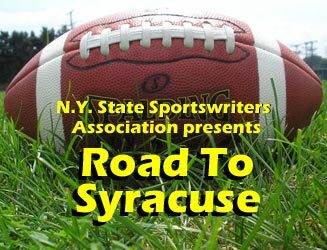 • Syracuse's combined district team won for the first time since October 2012, edging Skaneateles 96-90. Sisters Niahm and Orla Lacey each scored a pair of individual victories and swam on the 400 freestyle relay. • Poughkeepsie, which hadn't won a meet since 2013, defeated Roy C. Ketcham 84-80. Neither team led by more than four points until Laura Salmonese's win in the 100 breaststroke helped Poughkeepsie to an 80-72 advantage. Football: Jamesville-DeWitt linebacker Jake Wright was originally credited with 27 solo or assisted tackles in the 26-20 win over East Syracuse Minoa last weekend. After reviewing the video, the J-D staff credited Wright with 30 tackles. Wright, who also plays running back, ran for one touchdown and caught a pass for another score. He's also a defending Section 3 champion at 160 pounds in wrestling. College commitments: Poly Prep girls basketball star Shanniah Wright, a 6-foot-2 forward and first-team all-state selection in Class C, has picked Georgetown over a host of Ivy League suitors. state pick in Class AA as a junior, has picked LIU-Brooklyn. Following up: The Wellsville Daily Reporter caught up with Wellsville AD and baseball coach Dennie Miles, who is on pace to become the winningest coach in that sport in Section 5 next spring. But it wasn't baseball that has Miles back in the news. Until last week, his eight-goal performance for Friendship in 1967 in a 10-0 win over Belmont was the NYSPHSAA record in boys soccer. The mark fell when Slater Bushen scored 10 goals in a 23-0 victory. In his role as AD, Miles warned all of his coaches last year to be prepared to deal with runaway scores. "It's a tough situation. I sent out an e-mail to all of our coaches after Hornell beat us 71-0 in football last year saying, 'You have to prepare our kids for a game like that, you have to be prepared to be way up on a team in a game. You have to have a game plan for that,'" Miles said. Instant replay for N.J.? New Jersey is considering a plan to use instant replay at the high school football level, MyCentralJersey.com reported. this week. The New Jersey State Interscholastic Athletics Association is exploring a pilot program with a few schools. Those schools would be subscribers to the HUDL Sideline service and equipped with wireless tablets on the sidelines, where replays from cameras in both end zones and the press box would be instantly available to game officials. The NJSIAA expects to develop a plan that would allow for reviews involving fumbles, catches, touchdowns and out-of-bounds calls. National Federation rules currently allows coaches to use video review on the sidelines during games as a teaching tool for players following a specific down or series of downs.